Will I Be Swallowed Up or Will IT Be Swallowed Up? Well, my blog friends, I am really struggling. Can you tell? This whole blankie thing has really pushed me over the edge emotionally. Even as I knit the new blankie, it does not bring me peace. Perhaps it is because normally when I knit this blanket, it is because I am expecting a child...and this time, I am not expecting another baby. And I will probably never be able to have another baby. This fact makes knitting this familiar pattern that much more painful for me personally. I am struggling with the sadness. For anyone reading this who has ever struggled with this type of sadness, you know that it is not a trite sorrow that I am describing. It cannot be wiped away as simply as tears can be. It lingers...and it often waits just below the surface for some otherwise benign events to make it reappear. It is a sadness that threatens to swallow one whole. This grief that I am feeling, obviously reaches far beyond the loss of blankie, and encompasses me like nothing else. I am sure that it is clouding my judgment. It is definitely affecting my relationship with my neighbors. So the test for me now is this: Do I love my neighbors more than I love blankie and all that blankie meant to me and to my son...and all that it means for me personally to reknit that blanket when every stitch reminds me that I will probably never have another child? I say that I love my neighbors all the time here on my blog...because I do. Sincerely. They are very good people, good families. We are lucky and blessed to live in such a family-oriented neighborhood. So--out of love for my neighbors, I will be deleting any comments from the comments section that passed judgment on them, because that was never the purpose of my post. The family has let me know that it was the father who mistakenly threw out blankie, so I will also change any reference to the person who threw out blankie to "someone," so that no one has to unfairly take credit for it. I love children after all, and it would be very selfish of me to cling to my own grief instead of setting a child free when I had the opportunity to. Although I don't think I have said anything malicious about them, it is not my opinion that matters, it is their feelings that matter to me most. And I hope that they can find it in their hearts to forgive me. Aw, man, I feel so bad. I was talking to D last night and I felt your pain and couldn't imagine something like that happening to myself. Sentiment is so unforgiving. We attach ourselves to things and don't really realize it until that *thing* is either gone or someone wants to get rid of it. Unfortunately, I know your pain will be there for some time, but it will get less as the days go by. Maybe you can knit a little story into the blankie? A goodbye to the old and a hello to the new? Pictures? I know nothing about knitting...just trying to think of a way to help you is all. I am so sorry for the heartache you are experiencing. We struggled with our inability to have more children for many, many years. It was always right under the surface, and is one of the most deep, intense sorrows I have ever experienced. My heart and prayers are with you, it's a terrible struggle that I wouldn't wish on anyone. Have you considered knitting a blanket for your neighbor? I know it's a lot. I crochet afghans. But I'm thinking that maybe they might like a reminder that people treasure different things in this world. We're all different. Then you can put your love for them into it and release some of your pain. As for your feelings regarding no more children...I feel your pain there. I have one son. That's it. No more. Nor will there be more. Heavenly Father has let us know that our family is complete. It is very hard. There is a pain in the center of my chest when I think on it. It is like nothing else. But I know that there is a plan. And that's where faith comes in. I also know that doing things for a new reason helps. Knitting more for others helps. Creating scrapbooks for other reasons then family memories helps me (think Cub Scouts). Changing the way I do things helps me change my thinking. My son is 11. I no longer need to be thinking on the best ways to teach a toddler reverence or potty training. I get to think on pre-teen stuff instead. Good luck. My heart is with you in this. Your in my prayers...I feel your and I know you are in sorrow...just remember you have lots of love going your way. Sorry for your sadness, Jocelyn. I hope your skies brighten soon. In the meantime, I am sending hugs. i know about that pain/sorrow that is not easily wiped away. I appreciate your thoughts about your neighbors feelings that matter most over your opinion- this is a lesson that no one has ever taught me. Thought about Foster Adopt? you can get babies! I do not have children- perhaps never in this life- but by gosh- I sure do want those who want them to have them. Your a GREAT woman! Great- better than good. You will be blessed! Wow what a great challenge! You are in a test Jocelyn and you are also in a position to teach something to your neighbor...most importantly-to your children. I love that as you struggle to get over the pain you are still very mindful of your neighbors' feelings...an important character of Christ's disciple. You are on the right path. It is like going through the stages of grief and loss. It is ok to feel sad about it and also acceptable to feel angry about the loss of something very important then eventually you will accept that it is gone and just like what East Coast-er Momma said your pain will get lesser each day. I know you love your neighbor, this is not about your neighbor's action [accidentally throwing blankie] but it is about losing something very important. I love you,You are one of my inspirations. You will be fine. Bring some cookies to your neighbor and possibly talk about how you feel about the situation, it might help ease the pain. I'm sure IT will be swallowed up! You will definitely come out stronger; not be consumed by it. And the sorrow about perhaps never having anymore children is anything but trite. I'm struggling with it myself. I hope that life will brighten considerably for you soon. I can't write, I just need to talk to you. It seems like you are doing all of the right things. Now just to get through is the tough thing. Love you! Love Guys look on his face watching you work. My mind and heart are filled with thoughts and tender feelings. I remember I used to stew over things lost or destroyed or even damaged. Then we had a house fire. It didn't take me long to forget all about those things, you just don't have enough time to fret so, when you have lost so much. I also had a hysterectomy early in life, we did have two children before that happened. When our children were 13 and 11 we adopted a beautiful newborn baby girl, exactly a year later we adopted a newborn baby boy. An experience we had with a granddaughter. My husband and I went on a trip to England, the land of his parent's heritage. While there he bought a beautiful English made vase. He kept fresh flowers in that vase every day for me, I mean every day for years. Flowers that he grew himself. While visiting, our granddaugher was going to pick flowers from the garden to put in the vase. While filling the vase with water it slipped from her hand and shattered in the sink. She was devastated, started to cry and ran for the bedroom. I called her back, called her by name took her in my arms and said, it is only a piece of glass. She said, but it is grandpa's favorite, about that time he said no, you are my favorite. There have been many times since then, we have used that same phrase. It is only a piece of ...... whatever the case may be.I do hope that peace will come to you, sometimes we really have to dig deep to find that peace that comes from within at times like this. You are still able to knit, what a blessing! Oh Jocelyn! I just caught up on the situation and I cringed at this loss. But wow, you have really made it in to a teaching/learning experience with such tremendous value. You are quite the gal! I know that pain... but perhaps with every stitch & purl, you could think about a lovely scripture that has helped you in the past. And how it can help you now. Stitch that blanket with love... the love you have for your children. The love you have for others. The love you have for our Savior. I rather think that blanket is healing you, helping you go through the grieving process. (((hugs))) sorry my thoughts aren't eloquent. Just know they're from the heart and if you need to, you can rely on the love of all your friends & family to get through this. So I have to tell you ... I, too, made a Blankie for each of my children - a quilt. It took me SIX MONTHS to make my very first one. It was a beautiful nine-patch, blue and white. (Incidentally, it's just like the one from 'Legacy.') I SLAVED over that quilt - and almost threw the sewing machine out the window a few times. ;o) But it was my love that I was stitching into a pattern, row by row. 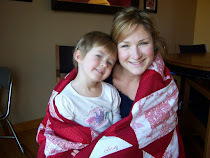 When my eldest son was put into my arms for the first time, I hugged him close with that quilt. He took to it immediately, and hasn't been parted from it since. We both cried for at least two weeks. And then I made him a new one. This time, I had three kids, and it took me almost a year. In the meantime, he adopted another blankie (a storebought one), and to be honest, never really took to the second one. It simply lies on his bed, a testament to the Long Lost Blankie of Yesteryear. I still don't think I'm over it. I just want to thank you for sharing your blanket story with us. When I heard the story, of course I felt sad for your son (and you) but I also felt sad for the neighbors who threw it out, without knowing what they did. Maybe this story is all about perspective? If we think of it in a Gospel way, I think Heavenly Father probably watches us throw away each others "blankies" every day, without giving it a second thought. We never truly know what our neighbor, friend or acquaintance is going through - but maybe because of your story we will take the time to pause and understand their view and what they might be going through. I don't know what to say much, but I think I understand your feelings about how you didn't want to damage your relationship with the neighbors and you find yourself in a position you didn't mean to. I know that awkward pain. As for everything else, I'm just really sorry. I can totally understand. There is a sister in my ward who doesn't go to baby showers and that is because she can't have children of her own. It hurts too much, but I understand. It would hurt me too. While I have a new baby, I can never have another baby because the danger of it. It makes me sad and at the same time I feel a little ungrateful because I have a baby and should appreciate the ones I have. Such a strange feeling. I understand your pain. We lost a 6 year old son in a go-cart accident in 2005. The neighborhood boy he was with only had a scratch and bump on his head and my son died. I certainly didn't wish their son was hurt worse or died, but it wasn't fair mine did. My son used to play with 2 Fisher Price fire trucks. I finally ended up DI'ing one of them. A couple years later we were foster parents and the 3 year old ended up with the fire truck I kept. I mistakenly thought it was the extra one I thought I DI'd, but didn't. I ended up giving it to the DI and later found out it was the one I kept. It's good the atonement can cover blankies and fire trucks--sometimes it just takes a while. I've been so wrapped up in myself and my family I missed the last 6 posts. I'm all caught up and I'm mostly sorry I haven't been there for you when you've felt so down. I know I can't "cure" your sadness but know that I love you and will try my best to lift your burden or mourn with you. We have our own set of trials to "refine" us and help us back to our Heavenly Father. You will get through this and be more outstanding and beautiful than you are right now. OH, my heart aches for you! I just caught up on all the "blankie" news and I can only imagine how distraught I'd be if this happened to our family. I know, I know, things are just things, but the truth is that some things DO mean so much, especially when associated with the people that mean the most. All I can say is, you continue to AMAZE me with your sweet spirit, your strength and your positive attitude as you try to find ways to learn a meaningful lesson from this, and to help your children learn from it as well. Those little ones are truly blessed to have you as a mommy. I, too, suffer from the heartache of knowing I will never be able to have another child. The fact that you are willing to face those feelings, and suffer through even that for your son makes your gift to him all the more special. I think he will understand that someday. And as for poor blankie, I think that Heavenly Father does indeed watch out for things that have been loved, and certainly ones that have been humbly and sincerely prayed over. Somehow I can picture blankie being rescued by some vigilant garbage worker - maybe cleaned up and sent somewhere to a child in need. Wouldn't that be a lovely fate for such a lovely, treasured thing?